The Koh-i-Noor diamond, otherwise known as the Mountain of Light, is worth around #100 million, and according to the British Monarchy has “legendary” status within their collection of Crown jewels. Set in the Queen Mother’s platinum crown for her 1937 coronation, it’s a dazzling symbol of the Royal Family and its history. But there’s a catch - India wants it back. A collection of Indian businessmen and Bollywood actors have begun legal proceedings to have the diamond returned home. Robert’s argument is borne out of colonial apologism and ignorance. To suggest that Britain was a benevolent colonial power is an offensive myth that must be de-bunked. Britain’s most lasting and damaging colonial legacy in the sub-continent was the partition of India into three countries: India, Pakistan and (eventually) Bangladesh. Relations between these countries have been fraught ever since. The partition led to one of the largest migrations in history, as many moved from India to Pakistan and vice-versa. It displaced 15 million people, and killed more than one million. When tensions boiled over in 1971, and Bangladesh fought for it’s Independence from Pakistan, 500,000 people died. The legacies of colonialism can still be felt today, as Pakistan and India remain at loggerheads, despite a shared history which was shattered by British divide and rule policies. Rather than benevolently ruling India as Roberts suggests, Britain oversaw some of the worst famines in human history. 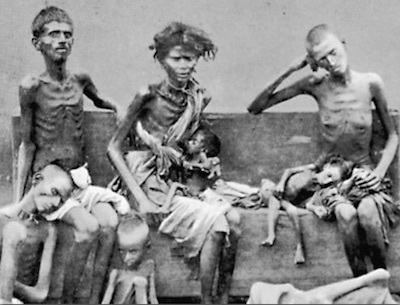 The famine of Bengal on 1943 was so bad that it’s been likened to a genocide. Three million Indians starved to death. The policies of Winston Churchill, who was prime minister at the time, were largely to blame for the suffering. Britain exported huge amounts of food from India, all for its own consumption. 70,000 tonnes of rice left the sub-continent between January and July 1943. In April 1919 thousands of peaceful protesters demonstrated against British colonial rule in Amritsar. They ended up being blocked into the walled Jallianwala Gardens. Once there, British troops led by General Dyer opened fire indiscriminately on the crowds, killing up to 1000 protesters. General Dyer was later lauded a hero by the British public, which afterwords raised 26,000 pounds for him as a thank you. Britain’s negative impact on India didn’t end after colonialism. Presenting itself as a great ally of the region, Britain continued to meddle in Indian politics. The most significant example of this was in 1984, when the British government advised the Indian government over Operation Blue Star. The operation saw the Indian government raid the Golden Temple - a holy site for Sikhs - which left hundreds dead. Such an attack would be the equivalent of the Britain advising the Italian government on attacking the Vatican. The aftermath of this led to Indira Gandhi’s assassination, and subsequent backlashes against the Sikh populations of India that led to 2,000 Sikhs being killed in Delhi. Only last year did Britain admit its role in it all.